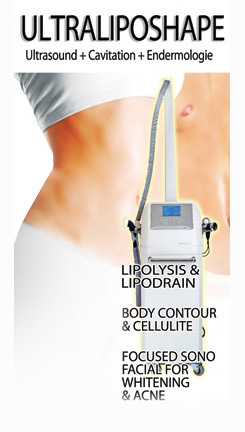 ULTRALIPOSHAPE performs powerful low- frequency cavitation system for deep cellulite removal and body contouring. Focused high energy waves create micro bubbles of vapor inside the adipocyte cells and interstitial fluids of cellulite. The liquid’s alternation of several phase, expansion and compression, causes the fat cells to implode with consequent release of fat and water to be metabolized by the liver.